Added the ability to let guests select filters or automatically apply a certain filter to all images. This is similar to instagram filters that have been pretty popular. Turn on this feature under Settings, General, Effects. Settings > General > Sharing stats now counts the number of actual prints coming out of printer rather than the number of unique files that have been printed. Allow setting description field for images uploaded to Facebook Pages. Add the option to turn off thumbnails while on the capture screen (Settings > Shooting > Show Photo Thumbnails). Better handling of margins when printing to crop less when printing borderless. Better validation of images for photos from some Sony cameras. We are excited to let you know that after a long wait, we have finally added an integrated template editor into dslrBooth for Mac. 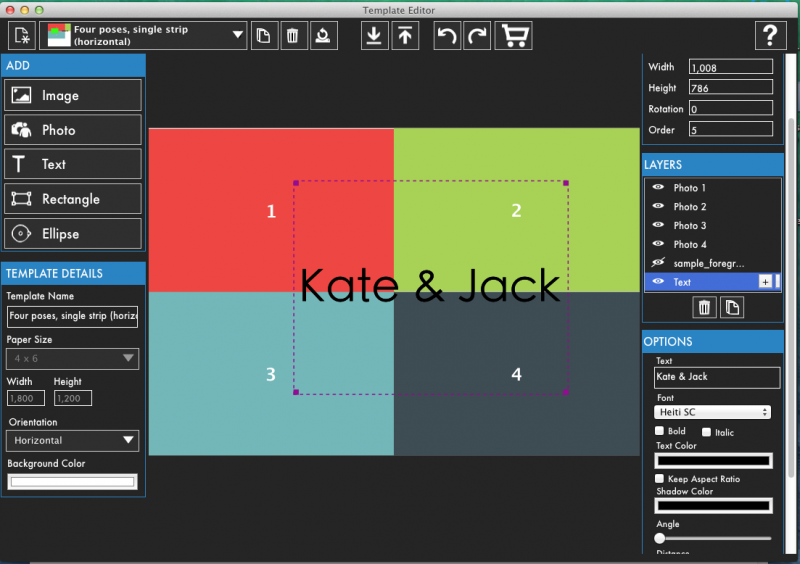 You can now create your own templates without having to resort to any 3rd party software. You can start by one of the dozen templates we have preloaded in the software and customize it or optionally you can create your template from scratch. You can easily add images, backgrounds, overlays, rectangles, circles, and text all from within dslrBooth. This makes dslrBooth for Mac much more powerful for even the casual user. For our Mac users, look forward to many more enhancements over the next few months.